The time has come for sustainable design to make the transformational shift from ‘doing less harm’ to being a ‘force for good’. This series explores how designers can make this shift, by celebrating the things we want, rather than limiting the things we want to avoid. Integrating the naturalness of light is proving to be a vital part of making this transformation a reality. Natural lights ever-changing spectrum illuminates our world. It brings out rich colours, dynamically contrasts characteristics, and focuses our attention. It cues and synchronises the planets rhythms, in much the same way as it cues and synchronises our internal biological and psychological processes. 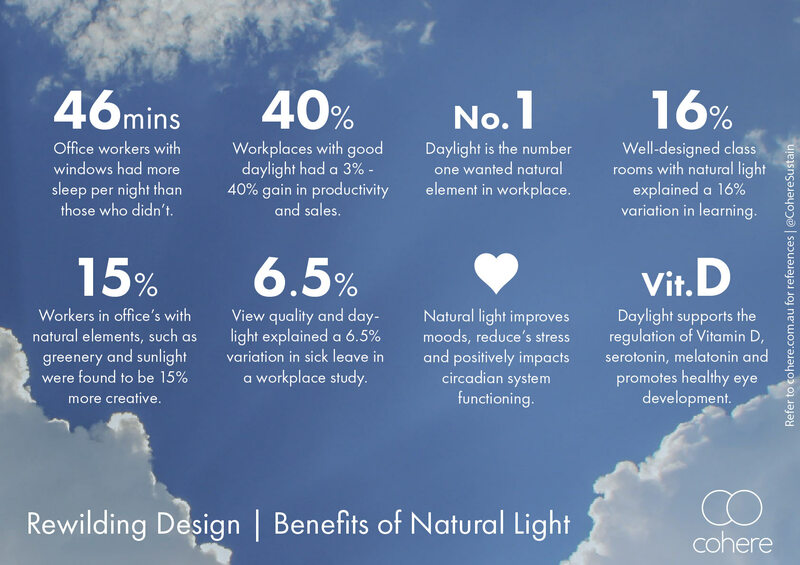 Indeed, there appears to be much that can be gained by facilitating an everyday connection with natural light. As Winston Churchill said, ‘We shape our buildings, and afterwards, our buildings shape us’. Given that people spend approximately 90% of their time indoors, this creates a design imperative for those who want to promote a healthy relationship between people and place. Wednesday 23rd March, 6:00 – 7:30 PM. Fitzroy Town Hall Hotel. Today, there is a predominance of design that tries to control nature to create a predetermined ‘ideal’ conditions. Rewilding Design challenges this perspective, encouraging designers to think about how they can bring as much of the great outdoors, indoors.